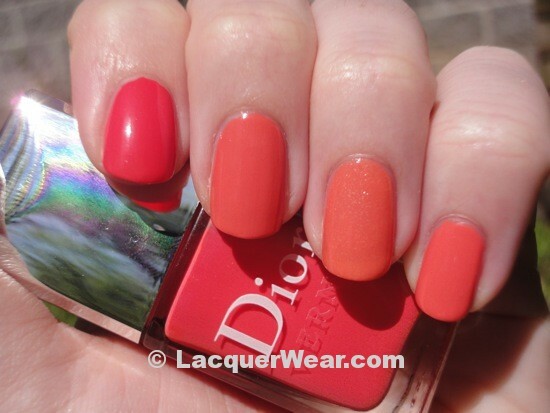 Dior has a couple of new summer polishes that are now available. I guess one of them isn’t really that new, since it’s a re-release of the very limited Saint-Tropez from last summer. But Bikini is an all-new peachy color that’s nice for spring into summer. I was able to grab up Saint-Tropez last year and reviewed it here. It’s a beautiful, bright turquoise, and was only available for a short time on the Dior website, so it was difficult to come by. It’s nice that it’s now more readily available at department stores. Both of these polishes are also up on Sephora‘s website. Bikini is a creamy peach color that is less vibrant/neon than many of the other similar colors that have come out this spring. It’s still juicy and fruity-looking, but is just slightly muted. The formula was a little thicker than usual for Dior, but it still went on okay and it only took two coats for this opacity. I think it’s the perfect summer polish, and packs just enough brightness but seems totally fine at work. I compared against a few similar shades below. 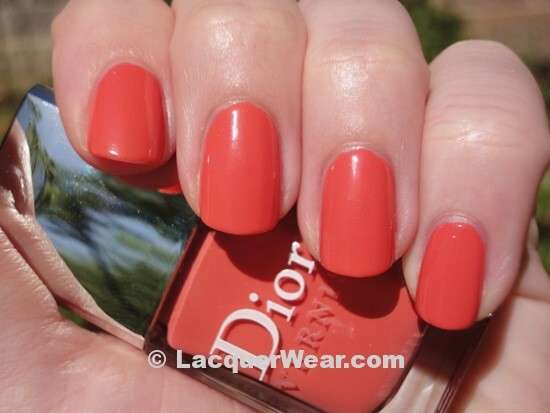 On my index finger I have Dior’s Psychedelic Orange, my middle finger is Dior Bikini, my ring finger is Dior Mandarin Orange (reviewed here), and on my pinky is Chanel’s Orange Fizz. 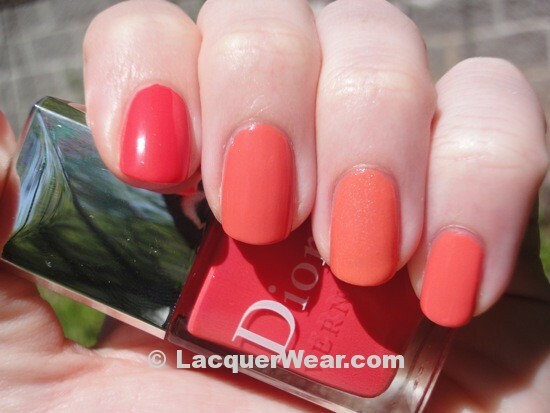 I haven’t done a full review of Psychedelic Orange, which is from the normal Dior line, but you can see that it’s a lot more pink and even red than Bikini. Mandarin Orange is more sheer and lighter, with a bit more yellow. It also has lots of little gold flecks that break up the color. Orange Fizz is the closest in color to Bikini, but they’re still pretty different. Orange Fizz is a little lighter and a little pinker. It’s less pigmented than Bikini and takes me three coats for opacity. It’s hard to see in my pictures, but it’s also a lot brighter than Bikini, as though it has some neon pigment to it. I like all of these peachy colors for spring and summer – they add a little pop of color while being kind of classic and generally appropriate. So it’s nice to have another peachy-pink to pick from in the great Dior formula and brush. Plus, Bikini looks really cute next to Saint-Tropez, if you’re picking up both. Both of the new Diors are available now at department stores and Sephora. I am totally in love with the colour also thinks its the perfect peachy coral, for spring and summer. could not resist also buying st tropez looks like a great colour for your toe nails in the summer! Thanks for posting. Thank you so much for your swatches and comparisons! I was walking by the Dior counter the other day when Bikini caught my eye. The only reason I didn’t pick it up is because I already own so many similar colors, including Orange Fizz. I’m a sucker for corals, what can I say? Seeing your swatches I can see that though they look A LOT alike, they’re different enough that I can justify picking up my own bottle of Bikini. Did I mention I’m a sucker for corals 😉 Anyway, thank you for this awesome blog! It’s a fantastic resource and I’ve enjoyed looking back at the archives. Keep it going! !